Crowdfunding platform Indiegogo Inc. has launched a new feature called Outpost, giving campaigners the ability to embed their campaign pages on their own web pages, instead of just having them hosted on Indiegogo’s site. The tool has been put into beta for several months, and it’s mostly geared towards campaigns that already have a well-established brand, an Indiegogo spokesperson said in an email. “As we’ve seen crowdfunding evolve, so has the way people or companies are approaching creating campaigns. We saw even a year ago that companies were hesitant to create campaigns because they didn’t want to direct their customers away from their own websites,” the source said. However, campaigners still get a spot on Indiegogo’s site, with the platform calling their pages “mirrored campaigns” that give them access to nine million unique monthly visitors and the chance to be featured in its email newsletters and on its social media channels. Using the Indiegogo site also helps campaigners keep track of what backers are doing, based on the site’s data analytics tools. While Indiegogo is saying it is the first crowdfunding platform to offer an embedding capability, British Columbia-based crowdfunding platform FundRazr says it actually built a widget to allow people to directly contribute to campaigns on a website about two years ago. And in December, FundRazr launched a software-as-a-service plugin for embedding the ability for visitors to create and display crowdfunding campaigns directly on organizations’ sites. 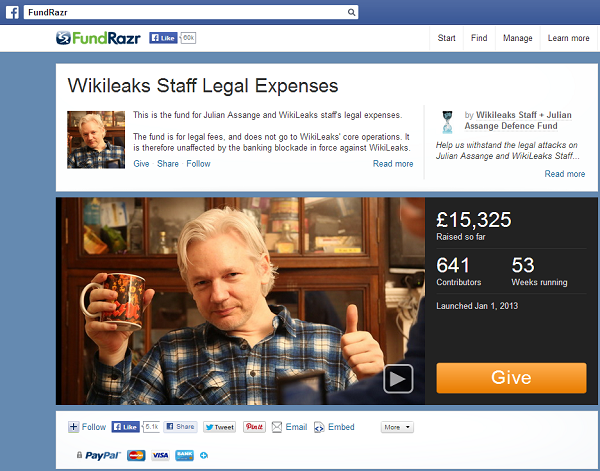 In fact, WikiLeaks staff have been raising legal defence funds for founder Julian Assange through FundRazr, as it offers both a way to donate through Facebook as well as on the FundRazr site. Former NSA contractor Edward Snowden also has a campaign on Fundrazr, aiming to raise money for his legal costs. At the time of this writing, Assange’s FundRazr campaign has raised about $27,250, while Snowden’s has raised about $97,000. He compares embedding crowdfunding campaigns on company sites to what PayPal Inc. did, when it allowed people to pay for things directly on an e-commerce site without having to be redirected elsewhere. It might be easy to blur the lines between PayPal plugins and embedded crowdfunding campaigns – after all, you could just donate to a site through a PayPal plugin, right? But Hatton compares PayPal to a “tip jar,” where people can simply donate or pass it by, while crowdfunding involves storytelling and salesmanship to get people to back a campaign. However, he says it doesn’t really matter Indiegogo is saying it is the first crowdfunding platform to offer embedded campaigns – FundRazr isn’t going to dispute it. “There’s a lot of innovation that’s happening outside of the main guys in here, like Kickstarter and Indiegogo. We have a curve of innovation like this, where you can run it on your site, where you can run as many campaigns as you want to on your site,” he says, adding one FundRazr’s customers, Healthline Networks Inc., recently added FundRazr’s software plugin to crowdfund medical expenses. “It’s a couple of lines of embedded script code, is all it took for them to become a crowdfunding portal,” Hatton says. In any case, it makes sense that Indiegogo would want to provide something that its rivals aren’t offering – especially when one of those rivals is Kickstarter, widely considered to be the crowdfunding heavyweight. Seeing crowdfunding platforms add new tools is a natural evolution of where the space is headed, says Craig Asano, executive director of the National Crowdfunding Association of Canada. He adds that in the future, we might expect to see crowdfunding platforms offering more services for facilitating transactions, as well as services to help companies prepare for their campaigns.